Trading Spaces have a many regular customers who use them for hire and purchase of portable buildings, offices and guard huts, for many different types of site all year round. One such customer is Hanson Concrete. Trading Spaces have been supplying their portable office requirements for over 20 years now. We recently installed a complete new set of site offices for Hanson Concrete in Greenwich, London opposite the 02 building. The site contained a mixture of facilities including offices, toilets, rest rooms, staff changing rooms and even a meeting room. The whole order was delivered on time and on budget, which is the reason that Hanson continue to use Trading Spaces so regularly. 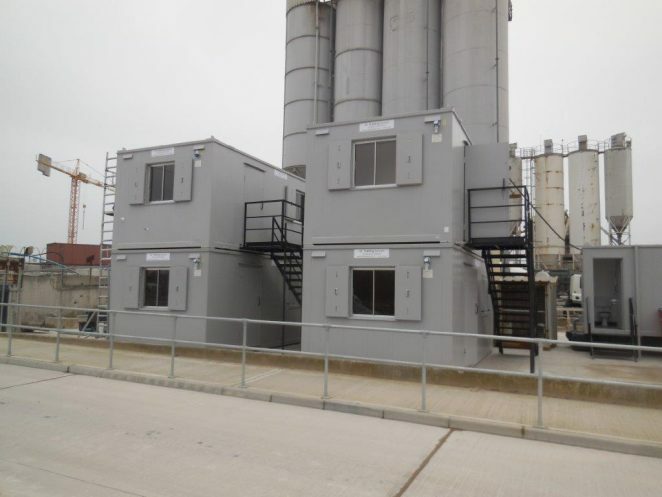 We can supply any number or type of buildings for a site, so if you have a complex requirement for your site that needs a variety of offices with toilets and rest facilities plus storage and even if you need your portable cabins or offices stacked because you have limited space, Trading Spaces can provide and deliver everything you need and then get it fully operational for you. To find out more about how Trading Spaces can help you with temporary mobile offices and cabins, just give us a call on 01206 212505 for a chat.